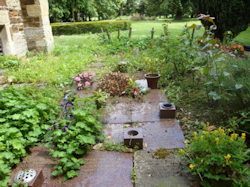 The Old Ashes area was one of the targets for the August churchyard meeting, diligently worked on for two hours and gradually revealing the roses bushes and the stones from beneath the weeds (shown). A large patch of nettles opposite the south door were also cleared away from the side of the path making it safer for people to walk along. A large broken branch caught high in the trees proved a challenge for getting down, rope and tackle were employed to get hold of the branch, then with the help of a passing member of the public and a team effort, the branch was finally persuaded down and taken to join all of the others that were placed upon the bonfire which was set alight a short while later. The Flower Festival was a great success for the churchyard stall, decorated with its bird survey results, pictures of its flowers, as well as bird boxes made by Stephanie and Christopher’s cub group. A couple of hundred people were spoken too during the festival, quite a few of whom had not realised just how large the churchyard was. Laminated maps of the churchyard were borrowed by some as they went to explore this hidden treasure within our town. We are looking at recruiting people who may be interested in adopting an area of the churchyard, perhaps the ashes area, and will come and help to keep it weed free when they can spare the time. The regular Churchyard workparty meet outside of the church on the first Saturday of every month at 9:45 am.